This post was originally published on November 8, 2008. It was substantially revised and reposted on January 25, 2016. 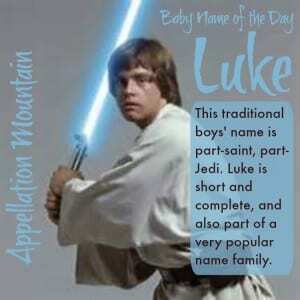 Luke is a saint and a Jedi, a soap opera hero and a staple name for boys. 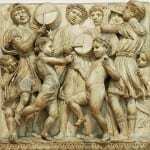 Around the 5th century BC, a tribe called the Lucani conquered part of southern Italy. Their lands stretched from the Tyrrhenian Sea to the Gulf of Taranto. Eventually they became part of the Roman Empire. The Greek name Loukas refers to the Lucani or one from their lands. The New Testament author was from Antioch, not Luciana. He became a widely admired figure, and the saint is the reason that this name is found in many languages. Luke came late to English, though. It didn’t catch on until the 1100s, possibly encouraged by the Crusades and an increased interest in the early church. Fast-forward a few centuries, and Luke was relatively uncommon in the US. It always ranked in the US Top 1000, but never much higher than the 200s, and often in the 500s. Paul Newman gave the name a boost in 1967’s Cool Hand Luke. It was a box office success, and a critical one, too. 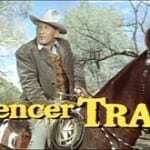 Newman’s character boosted the name, and it rose every year afterwards. Then came Star Wars, and the world has never been the same. The blockbuster debuted in 1977, generated two sequels, a trio of prequels, and eventually an entire universe built on the mythology created by George Lucas in the initial movie. The character answered to the surname Starkiller in early drafts, a much-discussed point. But I found very little on the character’s given name. Could it be a nod to George’s surname? 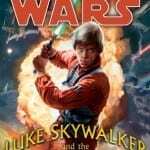 There are rafts full of analysis of all things Star Wars, and some speculation that the name’s similarity to the Latin lux – light – was the inspiration. More on that later. In 1976, the name ranked #222. By 1980, it had darted into the US Top 100. It teetered, falling for a few years, but by the 1990s, Luke was back in the Top 100 and rising. At some point, it becomes difficult to parse all of the fictional characters by the name. Soap operas embraced it, and in the 1980s, General Hospital paired their Luke with Laura. 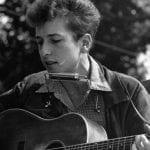 The romance became a pop culture phenomenon. Some of those early bearers of the name grew up – think of actor Luke Wilson, whose career started in the 1990s. Beverly Hills, 90210 made another bearer of the name famous in the same decade, but he was born Coy Luther Perry III. Lucas, the Latin form of the name. Lucius, a similar sounding but unrelated name derived from the Latin lux – light. You’ll sometimes see this meaning attached to any of the Luc-/Luk- names. The related Lucianus, which led to Lucian and Lucien. International versions, including the Italian Luca and French Luc, as well as Luciano and many others. 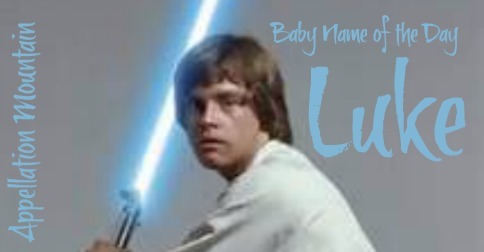 Luke could be a nickname for nearly any of the longer Luc-/Luk- names. On its own, the name is wildly popular. As of 2014, the name ranked #28 and rising. Factor in all of those related names, as well as sisters Lucy and Lucia, and the sound is absolutely epidemic. And yet, that’s not necessarily a bad thing. It fits with our preference for short names for boys, but it feels traditional. And it’s definitely a short name that seems complete, no formal name required. What do you think of Luke? Would you consider any of the Luc-/Luk- names or do you find them all too popular to consider? Although I tend to dislike single syllable names and my husband doesn’t like anything too popular, we just named our fifth boy Luke. He was due Christmas Day so I wanted something reminiscent of the holiday without being too in your face Christmasy. And with four older brothers obsessed with Star Wars it went over well with the family. Luke just fit him. I like Luke (not just because of Star Wars, though I am a pretty big fan of the franchise:), but I love Luca! It’s a nod to my Italian heritage, and it’s just so distinct. Idk. I have loved Luca for a long time, and it is definitely on my list for if I ever have a son. I don’t mind any of the Luc- names but can nitpick each of them, bar two and a half. Lucas and Luke both get a :thumbsup: from me! Lovely, simple classics, both. […] not quite a Katniss. […] single-syllable names in the boys’ Top 100 included John, Sean, Juan, Cole, Chase, Blake, Luke, and Jack. […] name for your child? […] is the Italian form of the saintly, enduring Luke. […] named twins, but I can’t help think that names that matchy spell trouble.